Driftnet - capture images from network traffic and display them in an X window . 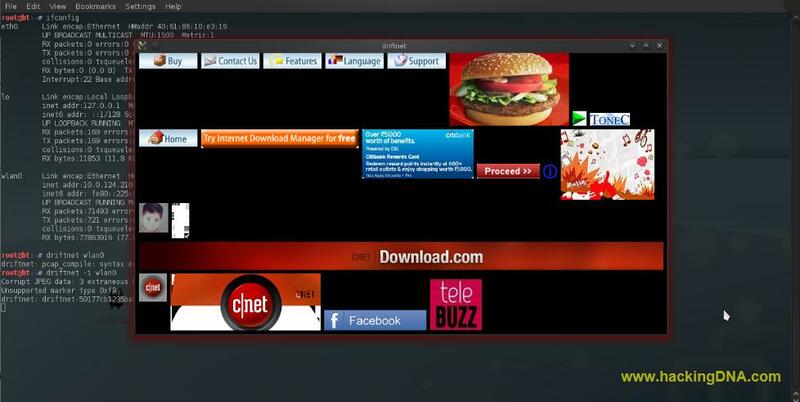 Driftnet watches network traffic, and picks out and displays JPEG and GIF images for display. It is an horrific invasion of privacy and shouldn't be used by anyone anywhere. Print additional details of packets captured to the terminal. Listen to packets on interface. By default, driftnet will try to pick up traffic on all interfaces, but this does not work with all versions of pcap, on such systems, an interface must be specified. On some systems, driftnet can only use promiscuous mode if an interface is specified. Do not put the interface into promiscuous mode. Operate in 'adjunct mode', where driftnet gathers images for use by another program, such as Jamie Zawinski's webcollage. In this mode, no window is displayed; images are captured and saved in a temporary directory, and their names written on standard output. In adjunct mode, silently drop images if there are more than number in the temporary directory. It is assumed that another process will delete images which it has processed. The filename prefix to use when saving images, by default 'driftnet-'. Use directory to store temporary files. 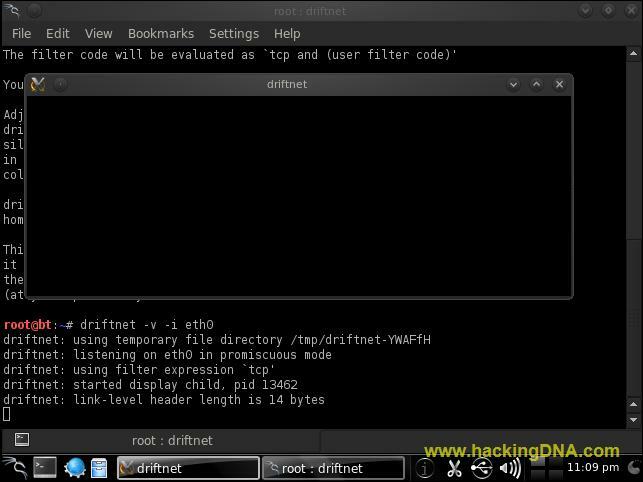 Driftnet will clear this directory of its own temporary files on exit, but will not delete the directory or any other files. As you enter the command driftnet is listening on eth0 interface in promicious mode. 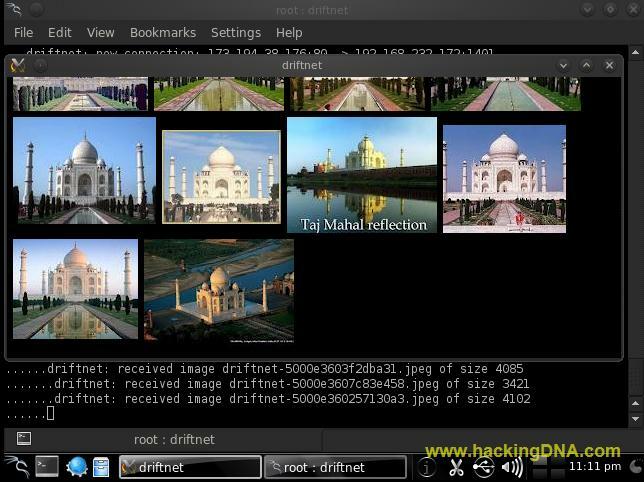 Driftnet captures the network images of tajmahal . 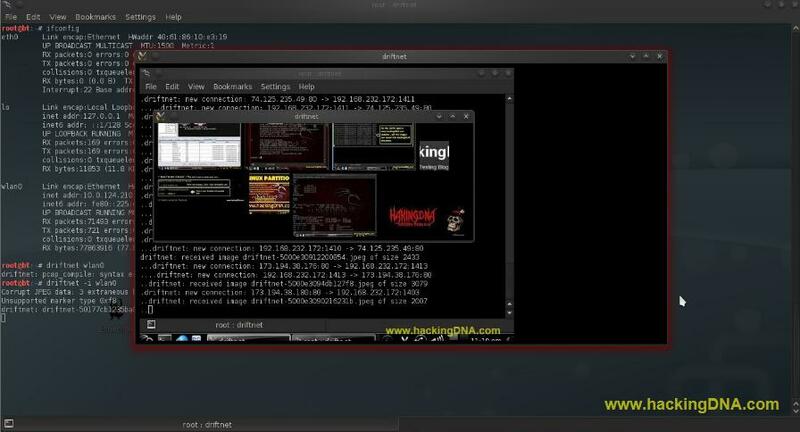 When we open www.hackingDNA.com , it shows the image of all the articles . With one command , you can capture images from network traffic and display them in an X window . Soon more examples will be added . If you like this tutorial , then leave a comment here , your comment is valuable for us . I have been searching for proper tutorial of backtrack and my journey ended on this site. My dear friend ,,whoever you are it doesn't matter but your work have greatly helped me. Thanks a lot ..keep posting really nice blog.